Back in February of this year, I was leading a bible study by Beth Moore titled, “Sacred Secrets”. There was one specific video that brought me to tears. Beth mentioned that even with all of the advances in science, God still reserves the right to be the only one to know that we even exist upon the first 7-14 days of conception. Jeremiah 1:5 says, “Before I formed you, I knew you.” Although I have heard this verse, I never truly grasped the meaning. Fast forward to now and I am almost fifteen weeks pregnant. There is no doubt in my mind that God shared that with me when He did as a sign of things to come and to prepare my heart to see things from His perspective. From the moment I discovered I was expecting, dreams of twins have been present. Upon telling both my mom and mother-in-law, they both said, “It is going to be twins.” Last week my husband and I attended my first doctor’s appointment. While my doctor was listening for the babies heartbeat, she asked if twins ran in either of our families. Was this another sign? She ordered me to go get a sonogram that same day. 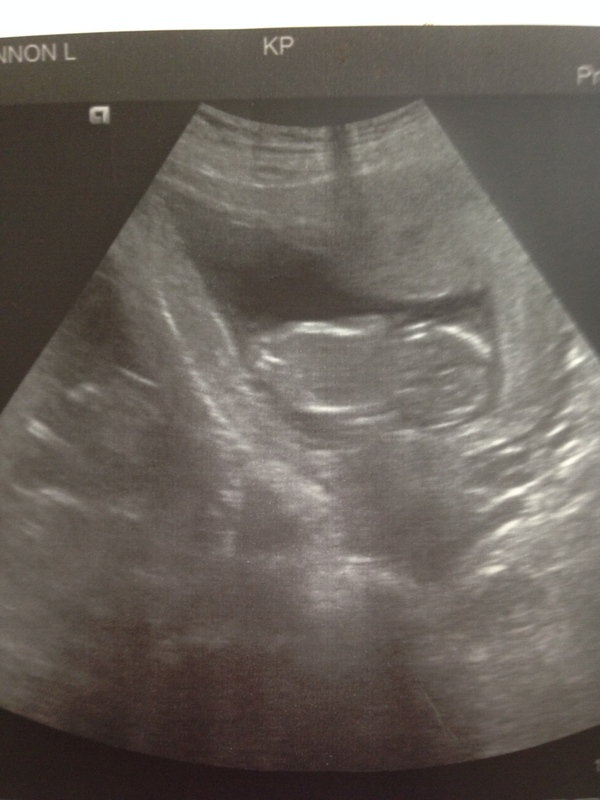 As the ultrasound tech began, he immediately asked if I had two uterus’. Then I saw it. Two sacs, two babies, a miracle none the less. After much confusion on his part, he proceeded to tell us that he thought it was just a mirror image of the baby reflecting off of something. He mentioned that he had heard of this before but had never seen it in his ten years in this profession. He called a fellow tech in for a second opinion. She too had never seen such a thing. After about forty-five minutes of studying the screen, they called a doctor in to take a look. Both babies were moving at the same time, in unison, so although they couldn’t tell us wether it was one baby or two, it seemed they had come to the conclusion that it was one. We were told we would have to wait for our doctor to deliver the results after the radiologist reviewed the findings and submitted them to her office. So the wait began. I have to admit that I am a little skeptical. God doesn’t give us signs for no reason. There is a purpose, a pointing to something bigger. A sign is defined as an event whose presence or occurrence indicates the probable presence or occurrence of something else; an indication or evidence of what is happening or going to happen; a gesture or action used to convey information or instructions. On Sunday at church when I read what the pastor was going to be discussing I thought to myself, “Great, a story that I already know so well I could get up and talk about it.” I should have known that God was going to teach me something that day because just when I think I have something figured out, He shows me something new that changes everything. As the pastor began speaking, he said two words that caught my attention and brought tears to my eyes…A SIGN! I already knew God was at work in our lives through the life of our unborn child/children so He used that to get my undivided attention. The pastor went on to explain that when God turned the water into wine at the wedding in Galilee, he was pointing us towards a new creation that was coming into the world. His sign was revealing something significant beyond the “wow” factor of what on the surface was the first of many miracles. Every time I have heard this story in the past, I thought Jesus was just doing this to reveal that He could meet our needs, even if they were insignificant in the big scheme of things. I thought it was His way of revealing His heart towards His children. Boy was I wrong and God blew me away that day. I went straight to my study bible to see what other insights I could gain from this story and this is what I read…Through this sign, Jesus revealed His “glory.” John 1:14 “We have seen His glory, the glory of the One and Only, who came from the Father, full of grace and truth.” Radiating God’s presence, Jesus reflected His glory. I believe that God used the appearance of two babies in our sonogram to remind us that He is and will always be the one we need to turn to for understanding and clarity. No other human or doctor will ever have all the answers. God will reveal everything to us in His timing. Until then, we were blessed with a sign that reflects His glory and the amazing things He is doing in our lives.